The Trump administration is pushing for Afghan-led reconciliation between Taliban narco-jihadists and Kabul as U.S. military and intelligence officials reportedly expressed concern that Afghanistan is teetering on the brink of providing haven to terrorists seeking to attack America. 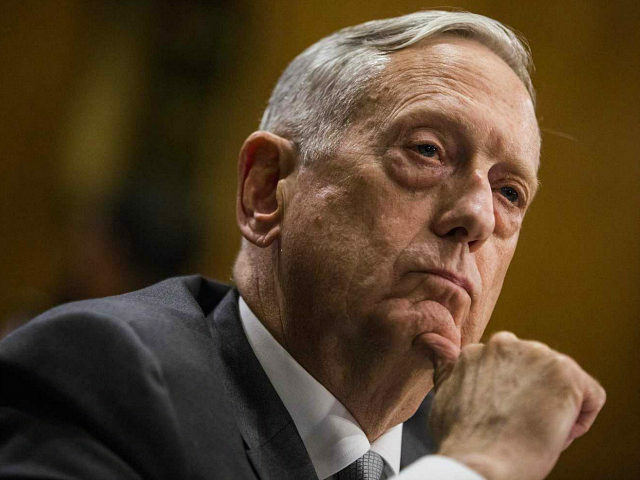 During a surprise visit to the country on Tuesday, U.S. Defense Secretary Jim Mattis described victory in Afghanistan as facilitating the reconciliation between Taliban terrorists and Kabul rather than defeating the jihadists on the battlefield. Echoing U.S. Gen. John Nicholson, the top commander of American and NATO troops in Afghanistan, Mattis indicated that the Trump administration’s goal is to pressure Taliban jihadists to engage in peace talks by making them realize they cannot win on the battlefield, notes the Associated Press (AP). “We do look toward a victory in Afghanistan,” Mattis said, adding, “Not a military victory — the victory will be a political reconciliation” with the Taliban, which has achieved a stalemate in recent years and shown little interest in conceding to the Kabul government. In response to the Taliban harboring al-Qaeda jihadists who carried out the 9/11 attacks, the U.S. government deployed troops to Afghanistan nearly 17 years ago to prevent the South Asian country from becoming a “safe haven” for terrorists who want to attack the United States. “But Defense Department and intelligence officials now say exactly that may be on the verge of happening,” proclaims the New York Times (NYT). In recent days, Afghan President Ashraf Ghani offered the Taliban a ceasefire and political power as part of what some analysts have described as unprecedented U.S.-backed peace negotiations. Trump inherited chaotic conditions in Afghanistan stemming from his predecessor declaring the U.S. combat mission over at the end of 2014, a move that included the withdrawal of most American forces. Within a year (in 2015) after the United States ended its combat operations, the Taliban became the globe’s most prolific terrorist group, carrying out more attacks (1,093) than the Islamic State (ISIS/ISIL), which had reached its peak at the time. Reconciliation between the Taliban and the Kabul government is a significant tenet of Trump’s strategy to end the nearly 17-year-old war. While the Taliban has remained mostly silent on Ghani’s peace offer, Mattis indicated that some members of the group are considering the possibility of engaging in talks with Kabul. “We’ve had some groups of Taliban – small groups – who have either started to come over or expressed an interest in talking,” the Pentagon chief declared, adding, “In other words, it may not be that the whole Taliban comes over in one fell swoop. That may be a bridge too far to expect. But there are elements of the Taliban clearly interested in talking to the Afghan government,” reports Reuters. Meanwhile, the Times reports that Afghanistan remains a “safe haven” for terrorist groups like the Taliban as well as its Haqqani Network and al-Qaeda allies and a growing ISIS branch. The U.S. military has repeatedly stressed that the Afghanistan-Pakistan region houses the “highest concentration” of United Nations and American-designated terrorist groups in the world. Many of those groups have established their primary strongholds along Afghanistan’s border with Pakistan, prompting President Donald Trump to suspend an estimated $2 billion in aid to Islamabad until it takes decisive action against the jihadists. ISIS officially announced its presence in the Afghanistan region back in January 2015, within a month after former U.S. President Barack Obama declared an end to the combat mission in the country. While the U.S.led coalition and local forces have dealt a significant blow to ISIS’s so-called caliphate in Iraq and Syria, the group has expanded its presence in Afghanistan, the United Nations and American military have cautioned. Despite the thousands of U.S. military casualties from the ongoing Afghan war, the U.N., the American military, and independent analysts have reported that both groups have grown stronger since the United States declared war on them in response to 9/11. “[A]merican officials have increasingly warned that safe havens are back,” reports NYT. However, terrorist safe havens never quite left Afghanistan, which kept the U.S. troops fighting in the country. The number of jihadi strongholds grew under the previous administration when ISIS developed its presence in the region. Terrorist groups, primarily the Taliban, continue to conquer territory. Under the previous U.S. administration, the Taliban eventually achieved control of more territory than during any other time since the U.S. military removed the terrorist group from power in 2001. Jihadists, mainly Taliban members, currently control or contest about 45 percent of Afghanistan, Pentagon data shows. President Trump has stepped up U.S. military operations against terrorist groups and their source of funding, but the Taliban remains a resilient foe. Citing independent and government assessments, Breitbart News determined that the Afghan Taliban’s strength and influence have reached historic proportions. It appears President Trump is in a position to end the war in Afghanistan by giving the American people and the Taliban what they want: the withdrawal of U.S. troops.